But finally that afternoon, when I could sit alone with Jesus for long enough to let the other voices still, He reminded me of truth: I am His and He is mine. He delights in me and desires me and it doesn’t matter one iota to Him that I couldn’t complete the exercises in the minutes allotted. It doesn’t make me one tiny bit less in His eyes. It doesn’t even make me less close to Him. Instead, it drives me closer and makes me love Him more, as I'm reminded again that I can do nothing on my own—can’t come close to Him, can’t settle myself in His presence, can’t hear His voice—and He draws me, settles me, helps me hear, just because He delights in me and wants me close. “Imagine you are Bartimaeus, the blind beggar. What do you hear, what do you feel as Jesus approaches?” I didn’t even get to how Bartimaeus' might be feeling. As soon as I found my place as the beggar, sitting at the side of the road, I was surprised by a lightness within me. Tears filled my eyes as I realized what had happened: I’d dropped the weight of having to be Jesus. I only realized when I took my place at Jesus’ feet that I’d experienced the scene first as though I was Jesus, crowds pulling at my clothes, begging for healing, I feeling the weight as though their needs were mine to bear. There’s a tree behind the home where we met. Its bottom has been hollowed by death but its top is wildly, vibrantly alive. I can't explain it; I only know that the rent ascends and descends from perfect love, and opens wide enough for me to step inside and stand wondering at the mystery which opens upward, too high for me to see the top. I want to stay there, to live in the love that opens wide for me and welcomes me in. I am there, held and surrounded and forever belonging. The mystery is too big for me. We, together, are Christ's body, Jesus living in us and through us. He looks out of our eyes at crowds and loves beggars. Sometimes we are the way He bears burdens and touches blind eyes with healing. But He is in us only because we are in Him, held and loved, ourselves beggars being healed into disciples. We rest, forever safe in the embrace that carries the weight and keeps loving us in the reality of what is in any given moment. I am touched by the beauty of the picture your words painted and the deep truth there – in me, the begger. Oh how true, then you deepen the truth with a picture of lightness in the role – I get that, too. I too often want to ‘fix’ things, be Jesus. Thanks for blessing me with your post! Thanks, Sandra. I’m glad Jesus met you here. Thank you for this gift of opening yourself to me in this Carolyn…for being entirely honest with your feelings and considerations as we spent time, sometimes side by side, on the way last week. Today was not good for me…I came up against a frustrated feeling of “what’s the use…there’s no room for this new way” but I recognize I DO have several NEW WAYS to take these thoughts to Jesus and ask him to hold me. Tomorrow will come and his mercy too. What more matters than that. Thanks so much for sharing this, Lesley-Anne. “Tomorrow will come and his mercy too.” So true, and so wonderful. Much grace to you, my friend, as you continue to lean into Jesus. I look forward to continuing to walk this path together. Thanks, Carolyn, so true. Beautiful. 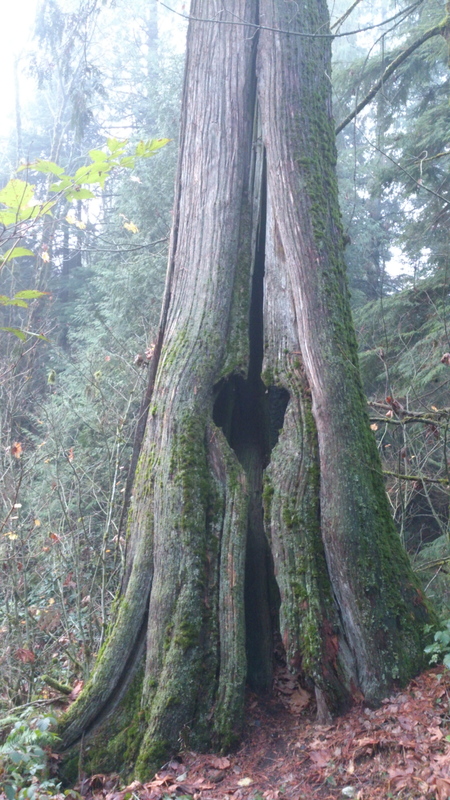 Love the image of the tree and you standing inside it, enfolded in love and mystery. Thanks Esther. I am deeply grateful for the gifts of last week, and the way you and Jeff and Deb allowed Jesus to flow through you to love us a little closer to Him. Such beauty and mystery indeed! There is something about dropping the weight of having to be Jesus (over and over again) that opens me to the possibility of being enfolded in love. Over and over again. . . yes. So grateful for Jesus’ gentle and continuous invitation to come close and be our small selves, needing Him. I love that you say things differently…i can see them differently then. Thanks, Ann. I love it when God helps me see things a little differently, and gives me words to share them! Wow! Wow! Wow! So true, yes we are called to be Jesus but we are not able to be Jesus if we are not also the beggar, and enfolded by love. Oh how I need that! Thank you!